About 30 years ago (I think it was that long ago), I decided I would make a quilt for each of my grandchildren. At that time, I had only one, so it was not such a grand challenge then. Well, I now have five grandchildren, and seven great grandchildren. Each of them (except the newest one, on whose quilt I am now working) has a quilt made for them that is like no other quilt that anyone has. Each of the quilts made for the grands have hand stitching in them. The great grands have quilts done completely on the machine. The great grands' quilts are patterned after the "love quilts" made to give as lap robes to senior adults and baby quilts to people who are battered women with babies. 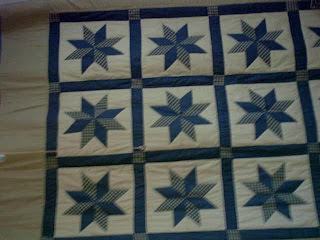 I don't have pictures of all the quilts, especially the quilt I first made for oldest grandson, Daniel, which I had begun and then put away until about 12 years ago, and then picked up again to finish for him. Perhaps if I ask him, he or his sweet wife, Whitney, would take a pic of it and send the pic to me. 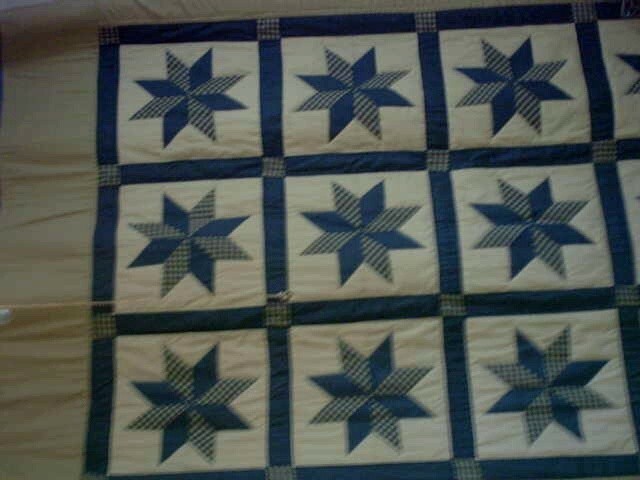 Above are some pics of some of the quilts I have made. The last one for a grandchild was made for my grandson, BJ, who is in the U.S. Air Forces. It was just finished and sent to him a couple of months ago. His was the only one that was reversible, (because the idea came to me when I was planning it). The four quilts pictured here were all of a size to fit a king-size bed and were not done on a quilting frame, but put together row by row. The babies quilts (for great grands,) I will publish a little later because I want to get this posted before I leave to go to have some routine blood work done prior to a doctor's appointment for Thursday. I will add them to this posting later today. I come by quilting quite honestly since my mom and my sister were quilters. I am a "Johnny-come-lately" when it comes to doing them, and got some of my ideas of how to quilt from books by Georgia Bonesteel who is an author of Lap Quilting books. Well, got lots to do today, and will be back to finish adding pictures to the post later. Come back and see the rest of them, if you so desire. This is Blabbin' Grammy signing off for a little while. I'm a gonna finish all this later. Hi Grammy, I enjoyed seeing your quilts and will come back to see the rest. You are so talented. I loved the conversation between you and Gramps about the outhouse, too. Wow! And pillowcases to match the flower quilt! Love them - I quilt too sometimes (that's what you call it when you buy lots of fabrics and never get around to finishing a quilt isn't it?). I like doing appliqué but love your pinwheels. It's a lot like writing - finding the time can the hardest part :-). Beautiful quilts. Hi Ruby those are some very ,very good quilts on photograph, youmust be very clever, I enjoyed your write. I expect you have lost count how many quilts youhave made over the years. Wow, what a TON of work you put into those. They are all just beautiful Ruby! I especially love the second one with all of the beautiful colored flowers. No doubt your grandchildren will treasure them forever! What a gift! God bless your busy day and I will definitely be back later to see the rest! Hi Grammy, I admire you talent, you make me want to attempt it again. I did q for quilts, but mine is different, you'll see! Gorgeous pics, fine work... you are talented! Hope all is well with you and you have a productive day! Quilting is a wonderful art that is slowly going by the wayside it seems. 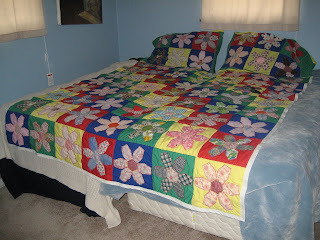 You are a fine quilter and I especially LOVE the second quilt with all the flowers. So colorful and gorgeous! Great work! Those are gorgeous!!!! Would you care to adopt me and make me one like the second picture? :) Truly beautiful! Those are beautiful quilts, Ruby. There's a big quilt show up here in Northern Colorado every year, and I always go to admire the wonderful work others do. I've never been a quilter, but I did crochet afghans for all my kids. I do have an authenticated antique quilt in my possession, but it's a bit fragile so I keep it put away, refolding or re-rolling it from time to time to keep the creases out. I keep wondering what use a quilt is if you can't use it or display it. I haven't figured out the answer to that one yet. Those are nice - my aunt made nice quilts for me as well. I love quilts. Yours are beautiful. I haven't made a quilt but I have made little wall hangings. Here's a site we have here in NZ, some beautiful patterns. That's some beautiful quilt work Ruby. And such a nice way to leave a piece of yourself with each grandchild. Grammy! I did my post on quilts too! Not very many "Q" words I guess. But mine is a story. I love you quilts by the way. Good work. Those are some absolutely beautiful quilts--treasured heirloom keepsakes for your grandkids. You do fantastic work. WOW!!! I'm good at patchworking but nothing fancy. Your grandbabies are very lucky. Thanks for sharing. Take care Ruby and have a great evening. God Bless!! Beautiful quilts, Grammy!! I have thought that I would like to try to make a quilt, but so much work goes into them. With my 4 children, it would take me 10 years to get one done! Maybe that wouldn't be a bad thing! A Nickel - What would it buy in 1941?